A couple of weeks ago, I wrote a blog about German spymaster Nikolaus Ritter and his American wife, Mary Aurora Evans. 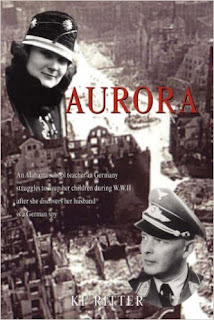 I based the blog on information I had dug up on Ritter as well as several book reviews on Aurora's biography (written by her daughter, Katharine (Ritter) Wallace). The biography sounded quite fascinating and I ordered a copy through AbeBooks.com, my go-to-source for second-hand books. As luck would have it, there was a copy at a Goodwill store in California, which was reasonably priced. The book arrived last week, and I have been reading it with interest. The author provides quite a bit more information on what Nikolaus Ritter did during his time in America, a lot of odd jobs which he often left after a few weeks or months. It sounds like he was a bit of a Prussian aristocrat who didn't like to be ordered around. Also turns out he was a bit of a free-loader, living off of Aurora's income while in the States. Fascinating glimpse of another side of the man. Naturally, there are always two sides (or more) to every story. 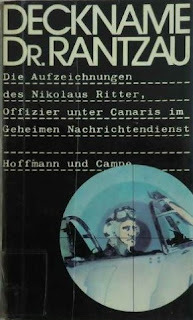 For several years now, I've had a copy of Nikolaus Ritter's memoir in my possession. It's written in German but is one of the few windows into the operations of the German Abwehr. Several months ago, I managed to plough my way through Monika Seidentopf's account of Unternehmen Seelöwe (Operation Sealion). My German is quite rusty and the puzzling military terms meant that Google Translate was my new best friend. I do think, after a bit of effort, that I got the gist of the book. Which makes me think that now may be the time to tackle Ritter's memoir.